The "Gallery Monklet" can be inserted into the content area of a page to display a specific photo gallery. NOTE: before you can Insert a Gallery, you will need to create a Gallery. Learn more about that at: http://help.ekklesia360.com/article/add-a-gallery/. In the Content editing section of a Page, click INSERT > INSERT MONKLET > GALLERY MONKLET. 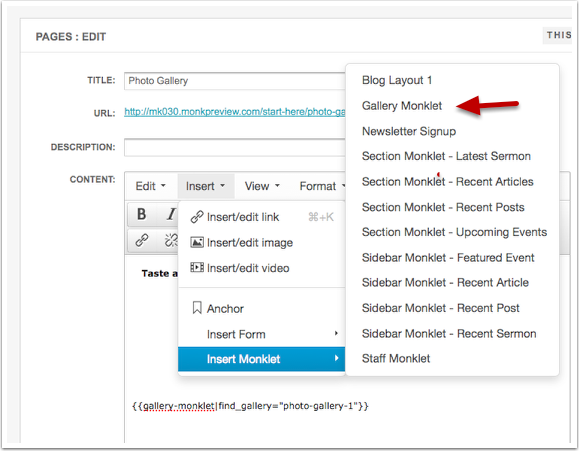 After you insert the Monklet you will use the find_gallery tag to define which gallery to use. The name of the gallery should be in slug format, which is the gallery name in lowercase with dashes in place of spaces.